From advanced 5G connectivity solutions to smart holographic augmented reality head-up displays, the latest in autonomous driving functions and new hydrogen-fuelled power units, this year’s Shanghai motor show proved without any doubt that China has once and for all arrived as an automotive force – and not only for domestic consumption but with truly global credentials. Aware at the threat China’s electric vehicle start-ups pose to their business, many of the country’s established car makers have also begun to create their own electric vehicle sub-brands to attract new customers, as evidenced by the prominence given to BAIC’s Arcfox, GAC’s Aion and Geely’s Geometry brands – all of which had something genuinely new on display. But just as electric vehicles are seemingly coming into their own, China is looking further ahead in a bid to outdo its western rivals. 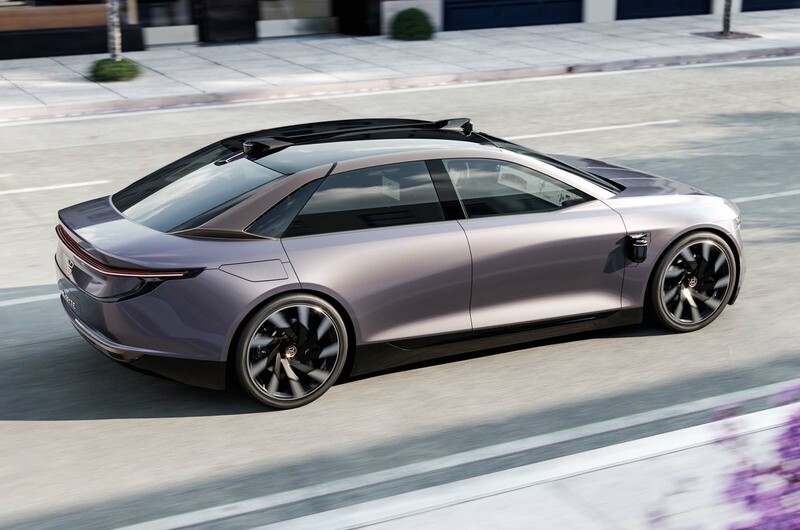 Nowhere was this more evident than on the Grove Hydrogen stand, which showcased the Granite – a highly desirable looking Porsche Panamera-sized sedan designed by Pininfarina and powered by a newly developed hydrogen fuel cell power unit. Audi has unveiled its new AI:ME concept as “an automated driving compact car for the megacities of tomorrow”. Like the radical Aicon and Elaine duo revealed in 2017, the concept looks ahead “10 or 15 years”, according to company design boss Marc Lichte. Audi isn’t the only German brand showing an extended version of one of its newest models in China. The new BMW 3 Series has been adapted for the Chinese market, and is on display in long-wheelbase 3 Series L form. Almost as long as the 5 Series available in Europe, the new model has been developed alongside the standard 3 Series, and will be built by BMW’s Chinese partner company Brilliance Automotive. Little is known about the model’s powertrain, but Chinese media reports that a four-wheel drive variant would likely use a 2.0-litre petrol engine coupled to an electric motor for a combined output of 469bhp. Despite Infiniti‘s recent announcement that it is pulling out of Western Europe, it is pressing on with plans for an electrified model line-up. The QS Inspiration concept, on display for the first time in Shanghai, previews an upcoming sports saloon “inspired by the art and modern architecture of Japan”. Like the QX Inspiration revealed earlier this year, it will sit atop the firm’s bespoke EV platform, and boast a stylish, minimalist interior, which will be clearly divided into separate passenger and driver zones. Taking the form of a conventional five-door SUV, the VS5 bears a heavy resemblance to the recently unveiled Skoda Kamiq, while the VA3 is a small saloon based on the Volkswagen Jetta that’s currently sold in China. Details remain scarce, but the E315 is expected to have five seats and make use of the same 1.5-litre Ford-derived unit that powered Landwind’s Range Rover Evoque copycat, the X7, which has just been forcibly discontinued. Taking the form of an SUV-coupé, the Geely-owned Lynk&Co brand’s fifth model is a BMW X6 rival based on its 01. It will sit atop the Volvo-developed CMA platform and will likely use the Swedish company’s range of 1.5-litre and 2.0-litre petrol engines. A European launch is likely but unconfirmed. Mercedes’ new small SUV, previewed in concept form, will sit between the current GLC and GLA models, and will take on rivals like the Audi Q3, BMW X1 and Volvo XC40. Styling across the GLB range will be influenced by the more utilitarian G-Class, while a range-topping GLB 35 variant will pack the same 302bhp 2.0-litre petrol engine as AMG’s A35 hot hatchback. Like the Engleberg, the e-Yi evolves the styling of Mitsubishi’s current Outlander PHEV, packs a 2.4-litre petrol engine mated to a pair of electric motors, and makes use of the brand’s latest torque vectoring technology to improve the handling of the four-wheel drive SUV. With a sleek four-door coupe design, the “ET preview” concept’s styling provides clear influence for the production model. No information about the car has been released as yet, but we know it will be all-electric and feature much of the technology found in the brand’s other models. The model is on display alongside the company’s EP9 electric supercar, EVE autonomous concept and ES6 and ES8 SUVs. Making its international motor show debut in Shanghai is Porsche’s latest SUV – the Cayenne Coupé. The value EV is headed to China first, given the country’s exploding demand for electric cars, before a potential European launch. A four-door saloon set to rival Tesla’s Model 3, Xpeng’s new coupé-styled EV has a claimed range of more than 311 miles according to China’s NEDC-based tests. There are currently no details on what drivetrain the P7 uses, but it is likely to share an electric motor and battery with the company’s G3, an Audi Q5-sized SUV that develops 195bhp for a 0-62mph time of 7.9sec. A Toyota development mule resembling the Yaris has been spotted testing at the Nürburgring, sporting the bodywork from the current car and a camouflage livery. The company has made no announcement regarding an u new hot hatch, but, sporting the same camouflage design as prototypes of the recently revealed Supra sports car, the car looks to be carrying out high-speed performance and handling tests. The main clue as to the model’s sporting ambitions are found at the rear, where two wide-bore exhaust pipes can be seen exiting a diffuser-style bumper. Elsewhere, wide alloy wheels wrapped in low-profile tyres round off a low, squat stance in the same vein as the range-topping GRMN variant of the current Yaris. The new Yaris, due to be launched in late 2020, will move to Toyota’s latest TNGA vehicle architecture, as used by the new Corolla and Camry. Toyota has launched a number of performance badges, including GRMN and GR Sport, based on its Gazoo Racing motorsport arm, and company boss Akio Toyoda has spoken of a desire to produce more performance vehicles. The performance division turned its hand to the Yaris last year, with the launch of the warm GR Sport variant, which produces 99bhp from its four-cylinder 1.5-litre petrol-electric powertrain. That model is available only in five-door form, which suggests this latest sighting could be based on the Yaris GR Sport. No matter how positive a motor show has been in China, there’s nearly always been something to provoke a ‘but’ when you draw conclusions on the state of the world’s largest car market and how it presents itself to the rest of the world. That ‘but’ is usually a cringeworthy copycat vehicle, or something that seems built in such a way that you know it would fall apart the minute they wheel it off the stand. But – and here’s that ‘but’ used for another reason – not the 2019 Shanghai motor show. Here was a show where the local car makers really could proudly display their products side-by-side with the western brands, demonstratiing, in many cases, the kind of designs and creative concepts that got people talking more than the established players managed. The likes of BYD’s supercar concept, Nio’s new electric saloon, Xpeng’s new saloon of its own – all of these were the real show stars. It should be no surprise, really. Ten years ago we were sniggering at the laughable quality of the average Chinese car. A couple of years later, the copycats started. Soon after then, everything started to look like a 1980s Honda Civic. Yet, by the last Shanghai show in 2017, the designs had distinction of their own and it was the dynamics and build quality that needed to catch up. The former of those points is still true, but what progress in such a short period of time. You couldn’t go looking for copycat cars as they simply weren’t there; Land Rover’s trademark infringement victory against Landwind was perhaps the final, definite line in the sand on that unwelcome distraction. Even the show girls that usually adorn nearly every stand were absent. This was a progressive show with real global relevance. On that last point, this was the show where Chinese car makers went further than simply saying they’d like to export models into Europe one day – they actually started to put dates on their intentions. Wey, China’s first premium brand, will launch at the Frankfurt motor show in September. Electric car maker Aiways will launch in Europe next year, and others will not be too far behind. Those brands will be the first, but they will not be the last, and Shanghai 2019 will be remembered as the show where China came of age as a global car maker. There are huge challenges to overcome, on branding and on those driving dynamics in particular, but, given the rate of progress of Chinese car makers, and the success the likes of Kia, Hyundai and Dacia have enjoyed in recent years when starting off from similar positions, who would bet against success? 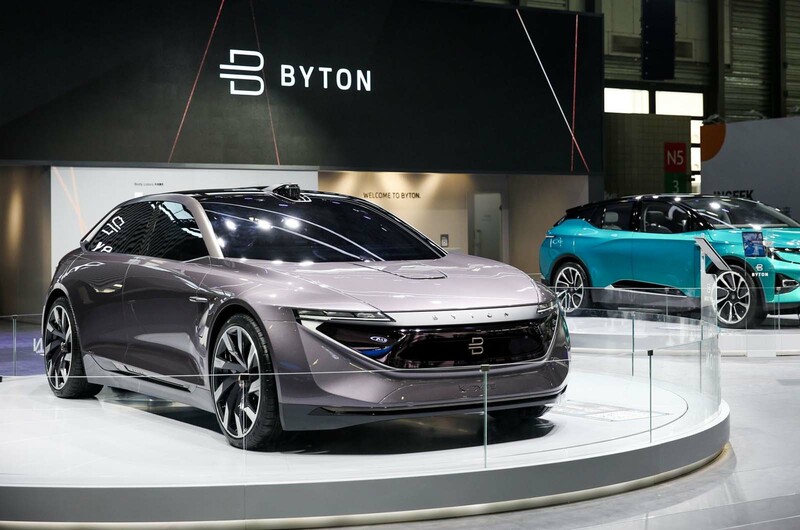 Chinese electric start-up Byton will begin initial production of its M-Byte SUV this summer, ahead of volume manufacturing by the end of 2019 – but will do without company co-founder Carsten Breitfeld. The former BMW i-division boss is set to step down as Byton CEO for a new, undisclosed role within the start-up industry. “Carsten helped build a strong Byton brand and bring in the right people to take our start-up to the next level,” Byton co-founder and CEO Dr. Daniel Kirchert. “Now we are focusing on our main goal to achieve the on-time-start-of-production of the first Byton series production model in 2019 with our strong team and partners. The production version of the M-Byte will be built at the company’s Nanjing facility, which is on schedule to open within the next three months. The car will then debut in the Chinese market towards the end of the year, ahead of the introduction of the K-Byte saloon in 2022. Byton will appoint a new CTO shortly, as it prepares to close its final round of investment funding. It recently secured £385 million to help it take on established players such as Tesla. Byton’s chief vehicle engineer is Irishman David Twohig, who formerly worked for the Renault-Nissan Alliance and won the Mundy Award for Engineering at the 2018 Autocar Awards for his work on the Alpine A110. We caught up with Twohig at the Pebble Beach Concours event to find out more about Byton’s ambitious plans. Where is Byton in terms of products? Will all Byton vehicles sit on the same platform? Why stick with ‘three-box’ design when you don’t have engines up front? You are committed to having partial autonomy from launch, but how quickly will you be able to deliver true ‘eyes off’ autonomy? The big question: how will Byton succeed and actually make money where other EV makers have failed? The Toyota iQ city car has been reborn in China, with the rising Singulato firm using it as the basis for a new electric-only iC3 machine that has been launched at the Shanghai motor show. Beijing-based Singulato was founded in 2014 as an EV-only firm, and is gearing up to launch a mid-size iS6 SUV later this year. It has agreed a deal with Toyota to use the eQ, a limited-run electric version of the iQ that was sold in the US and Japan, as the basis for its iC3 city car. Singulato has pitched its car as an “urban dream cruiser”. Besides switching from combustion engines to an EV powertrain, the iC3 is built entirely with iQ parts, including the chassis, brakes, steering and suspension. It also features some mild exterior design tweaks, and a new, bespoke infotainment system. Singulato has developed its own electric powertrain for the new model. While it has yet to reveal full technical details, it claims it will offer a range of around 186 miles on the NEDC test cycle. It is understood Singulato is aiming to sell the car in China for about £11,500. A Singulato spokesperson told Autocar that it bought the iQ design from Toyota for a “nominal cost”, as part of a wider agreement between the two firms. Reuters has reported that Toyota will be given preferential rights to purchase Chinese ‘green car credits’ from Singulato, which will help it meet government quotas in the country. Toyota recently announced it was offering rights-free access to around 24,000 patents, including those for electrified technology, and has been looking for partners to further its electrification and expansion plans. The iQ was revealed at the 2007 Frankfurt motor show and went on sale the following year. It was axed in 2015 due to slow sales. As well as the electric eQ version – sold in the US as the Scion iQ EV – Toyota developed a limited-run performance version tuned by Gazoo Racing. The iQ was also used as the basis for the short-lived Aston Martin Cygnet city car, which was produced from 2009 until 2013. It will come as no surprise that China’s car manufacturers used the 2019 edition of the country’s fastest-growing motor show to debut a range of new models. There was a slew of new metal in Shanghai, in both concept and production form. And with home-grown companies now turning their attention to foreign markets, these arrivals are becoming increasingly relevant to the wider world. Below, we’ve selected some of the models that could be arriving in Europe very soon. Think the new BMW X7’s grille is imposing? That of the Hongqi HS7 gives it a run for its money. Chinese buyers like strong, aggressive and chrome-laden front ends on their cars, and BMW’s latest design strategy starts to make sense when you see what the Chinese brands’ cars look like. After all, this is by far the world’s biggest new car market, so companies are going to develop products to suit it. Ora R1: £7000 EV, anyone? There’s more than a passing resemblance to the Smart Forfour – mixed with a dash of Honda E – in the Ora R1. The dinky city car is also one of the world’s cheapest EVs, with prices starting from less than £7000 once Chinese government subsidies are taken into account. It can reportedly travel up to 200 miles on a single charge, although we’ll take that claim with a pinch of salt. Leap announced itself back in 2017 with a small electric sports coupé that looks a bit like a cross between the Subaru BRZ and Volkswagen XL1. Now it has revealed a new concept car in Shanghai called the C-More, which is on trend with rear-hinged doors and an electric powertrain. Production is tipped for 2020. Leap is one of several well funded start-up Chinese car makers and recently launched a bid to raise another $372m (£284.3m) in funding. The Aiways U5 is a new electric SUV that will be launched in Europe next year. It will be offered on a lease-only basis at an expected cost of less than £345 per month. It’s Volkswagen Tiguan-sized and features a 65kWh battery pack that’s good for a range of 312 miles on the NEDC cycle. It can be engineered for right-hand drive, and although no decision has yet been taken, Aiways overseas boss Alexander Klose says there has been strong interest from the UK. The brand infamous in the West for releasing a near-copy of the original Range Rover Evoque, Land Wind seems to be changing its ways for 2019 after Chinese courts found in favour of Jaguar Land Rover and ordered sales of the original X7 halted. The new-look model is of a bespoke design, so it shouldn’t fall foul of any copyright claims. Fledgling EV brand Xpeng is chasing the Tesla Model 3 with its new P7 compact saloon. Its long wheelbase, short front overhang, frameless doors and pop-out door handles all seek to directly rival the American firm’s most affordable model. Xpeng claims the car will achieve 311 miles of range on China’s NEDC-based tests. Great Wall’s premium SUV brand, Wey, is targeting Europe with its VV5 SUV, which it hopes will take on the likes of BMW and Mercedes-Benz at the top end of the market. Wey has only existed for two years, but it has already managed to sell more than 250,000 cars in China. An electric version of the VV5 will likely be its halo model for a European push from 2020. Nürburgring record-breaking EP9 hypercar aside, electric car maker Nio has so far only released SUVs. That’s set to change in 2021 with the ET saloon, which was previewed by an 80%-representative concept in Shanghai. Little is known about the underlying powertrain, but Nio has hinted at a 220kW dual-motor set-up and more than 300 miles of range. Singulato’s imaginatively named ic3 Urban Dream Chaser will be familiar to Europeans: the electric city car is based on the Toyota iQ. The two firms have signed a deal to license the design, giving the Chinese car start-up a base for its first model and the Japanese giant experience of the Chinese EV market. It will also let Toyota buy green car credits in the future, which could have a big impact on its plans for China. Production is earmarked for the end of 2020, with a bespoke powertrain alongside existing iQ parts including the chassis, brakes, steering and suspension. There are minor design tweaks from the iQ and a new infotainment system inside. The motors and battery pack are being designed by Singulato; an NEDC range of around 186 miles is predicted. Grove, a new company that made its debut at the Shanghai show, is aiming to become the world’s first hydrogen fuel cell-only car manufacturer. Its first model, the Granite, was styled by Pininfarina, and its Obsidian SUV will expand the range in 2020. Grove claims its cars will manage upwards of 600 miles of range, aided by regenerative braking. It has global ambitions, having secured an agreement to expand to Australia and New Zealand, but it’s too early to talk about a European launch. The Preface is a sign of things to come from China’s largest car manufacturer, Geely. The work of a team led by industry veteran Peter Horbury, the more upmarket saloon concept hints at sportier styling and more refined interiors for forthcoming Geely production models. We hope the coach-style doors make it through to the final product too. Nissan has revealed a limited edition variant of the 370Z coupé to celebrate 50 years of its Z performance range. The 370Z 50th Anniversary Edition has been unveiled in New York, with a paint scheme inspired by the SCCA-winning BRE 240Z raced by John Morton in the early 1970s. The special edition is based on the 370Z Sport, one of four trim levels available on the Porsche 718 Cayman rival for 2020. Buyers can choose from two retro-inspired liveries (white/red or silver/black), which feature a contrasting bonnet, wing mirrors, bootlid and roofline, alongside two signature racing stripes on each door. Other bespoke design features include unique 19in lightweight aluminium wheels with red accents, rear spoiler delete and 50th anniversary badging on the front and rear bumpers. Inside, the 50th Anniversary Edition receives an Alcantara-clad steering wheel with motorsport-inspired centre stripe, 50th Anniversary-embossed kick plates and backrests, and suede door panel inserts. A Bose sound system is equipped as standard to 370Zs specced with the celebratory trim, as are dark chrome interior trim accents, four-way power seats and high-intensity xenon headlights. A close-ratio six-speed manual gearbox is also standard fitment, but buyers can opt for a seven-speed automatic which boasts a target shift time of under 0.5 seconds. Power output is unchanged from the standard 370Z, which features the same 3.7-litre V6 petrol engine producing 323bhp and 270lb ft.
Nio has revealed a new concept car that previews its first saloon model at the Shanghai motor show. The ET Preview is said by insiders at the Chinese firm to be around 80% representative of an electric large saloon that’s due in production before 2021. It acted as a demonstration of Nio’s high-density nickel-cobalt-manganese battery pack and 220kW electric motor powertrain, which the company claims will deliver a cruising range of up to 317 miles under China’s NEDC-based tests. The ET will use high-efficiency permanent magnet motors to drive its front wheels, in conjunction with high-performance induction motors at the rear. It is understood to be closely related to the ES6 SUV. Nio has solely made SUVs to this point, after launching with the limited-edition EP9 electric hypercar. The ES6 will enter production this June, joining the Audi Q7-sized ES8 in Nio’s range. It gets an NEDC range of 317 miles from its 84kWh battery pack. The ET Preview was penned by the original BMW i design team, including exterior designer Kris Tomasson. It was designed in Munich, Germany but is currently planned for sale only in China. Nio is yet to disclose any plans for exporting models in the future. Nio has so far delivered some 15,000 examples of the seven-seat ES8, which costs some £51,000 in China before subsidies, since production began last June. The ES6 will cost from the equivalent of £41,000 before subsidies. The brand also used the show to announce the extension of its “One click for power” supercharging network to users of other EV brands. Available through the Chinese messaging platform WeChat for 280 yuan per service (roughly £30), the collect-and-return charging service has already been used over 93,000 times by Nio owners. Shanghai is quickly becoming one of the world’s premier motor shows, with home-grown manufacturers looking to expand outside their native territory and European brands searching for a lucrative piece of the world’s largest car market. Manufacturers are happy to cater to the Chinese appetite for extended-wheelbase saloons, big-grilled SUVs and electric cars, with BMW introducing the 3 Series LWB and Aston Martin unveiling the Rapide E.
At this year’s show, the likes of Geely, BYD, Wey and Nio have introduced cars that will eventually make their way to Europe (including the UK), while Geely-owned Lotus finally confirmed its electric hypercar, the Type 130. Other European brands used the show to reveal concepts, with Audi showing the AI:ME, Renault presenting the City K-ZE electric compact crossover and Volkswagen extending its upcoming ID electric model range with the Roomzz large SUV. From an entire conference centre filled with new cars and industry executives to question, our reporters have spilled their notebooks to bring news straight from Shanghai. Here’s a curiosity of the Chinese market: a Lexus MPV. Showing that brands can mean different things in different markets, the LM is one model you can bet won’t ever make it to Europe. A vast thing with strange proportions and a grille to make the BMW X7 look reserved, it’s one we’ll happily go without. After announcing that it’s pulling out of Europe, Infiniti is pinning its hopes on the Chinese market. Sales and marketing chief Christian Meunier has confirmed that its first electrified model will be built in China for China. The upmarket Japanese brand is also launching its QX50 SUV in China for the first time. Great Wall‘s new premium SUV brand, Wey, has confirmed its intention to launch in Europe to take on the likes of Audi and BMW. It has also revealed a high-tech concept car called the X, which includes a host of technology, such as laser headlights, that Wey plans to launch on its future models. Great Wall is one of China’s largest car groups, with the best-selling Haval and Wey SUV brands. There’s talk here Volkswagen, the long-term market leader, is increasingly concerned and wary of its growth and success. Perhaps it would be paying even closer attention if Ferdinand Piëch had invested; the ex-Volkswagen chairman met Great Wall founder Wei Jianjun at the Frankfurt motor show two years ago to discuss investment and involvement, but it never came to anything, insiders claim. There’s a Chinese EV start-up named Weltmeister, which means world champion in German. Why such a name for a Chinese car company with no export ambitions? However, perhaps the move has backfired, because Shen told us that the firm is struggling to register the Weltmeister name as a trademark, so it might end up calling itself WM Motor instead. Geely is perhaps the stand-out performer among all Chinese brands for design, which is no surprise, given it has the talents of industry veteran Peter Horbury atop its team. Its Shanghai show star in 2019 is the Preface concept, a sleek saloon that’s said to preview Geely’s future styling direction. It also shows Geely’s desire to push its models upmarket with ever sportier styling – particularly its saloons. European motor shows are often dominated by the big German car makers, but Shanghai is different. Yes, the Volkswagen Group has a huge presence here, but Chinese brands have taken the lion’s shars of floor space. Nio, a relative newcomer, reflects the vastness of the Shanghai show with its huge – and hugely popular – stand. Weltmeiester (or WM Motor) has revealed its second model, the EX6. Like so many at the show, it’s an electric SUV. Weltmeister hopes to be different by offering several different battery pack sizes in the same body, saying only Tesla does this in China. It’s also proud to be be a mid-market brand; CEO Freeman Shen says most EVs are either small and cheap or large and expensive and thinks his firm can step in the middle. One of the biggest crowds today was around Geely’s new Geometry electric car brand. The first model, a saloon, is smart and inoffensive enough. Yet it’s by some margin the most credible looking and priced of China’s entry-level electric cars, a class that’s full of somewhat dowdy and poor quality efforts to this point. This could be the latest big success for the car industry’s biggest growing force. We think of Toyota as staunchly hybrid, yet in China it has now gone fully electric, and with a model that’s familiar here as the C-HR. China’s regulations make EVs a necessity but perhaps it could prompt a change of strategy elsewhere, too? Electric car maker Nio displayed its battery swap technology at the show. Already up and running on the highway between Beijing and Shanghai, it can swap the batteries out of a Nio ES8 in less than five minutes. The stations can deal with a total of 70 swaps in any 24 hour period. What range anxiety? New Chinese start-up Grove, which claims to be the world’s first hydrogen fuel cell-only mass production company, has launched at the Shanghai motor show with a concept car designed by Italian styling house Pininfarina. The concept car is the result of a “wide-ranging” deal between Pininfarina and Grove, which is based in the Chinese province of Wuhan and has a design studio in Barcelona, Spain. The Grove Pininfarina concept is a striking four-door coupé-style saloon, with a bold front grille and a highly sculpted rear diffuser. It also features frameless doors and cameras in place of wing mirrors. No technical or performance details have been revealed. While the firm has not confirmed a name for the car in press materials, the rear number plates suggests it uses the moniker Granite. Grove is currently developing a range of hydrogen-powered vehicles, beginning with a four-door SUV called the Obsidian, which was also on display in Shanghai. The firm has said that this machine will have a range of up to 625 miles, with a powertrain that use regenerative charging to regain energy under braking. The company aims to start sales in China later this year, with volume production starting in 2020, and plans to expand into other markets with the goal of becoming “a world leader in clean transportation”. Grove recently secured an agreement to expand into Australia and New Zealand, but there are no details of European expansion plans yet. Grove Hydrogen was established by the Chinese Institute of Geosciences and Environment, which currently manufactures and distributes hydrogen extracted from industrial waste. The Institute says it is working with large Chinese cities to install and expand hydrogen a charging infrastructure in the coming years. Pininfarina has also designed a new Karma sports car, which is on display in Shanghai.